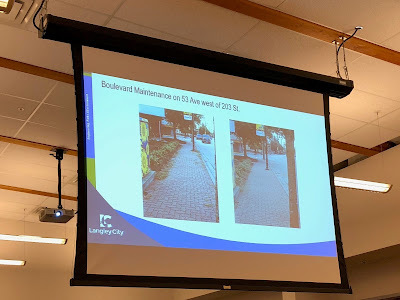 Is Langley City on the right course to make our streets safer for walking, cycling, and driving? Take my 30 second survey. Over the past year, there have been some significant changes to the road network in Langley City. These changes have been implemented to make walking and cycling safer and more enjoyable in our community. Other changes have been implemented to slow down motor vehicle traffic to make our streets safer and to reduce collision hot-spots like along 50 Avenue. 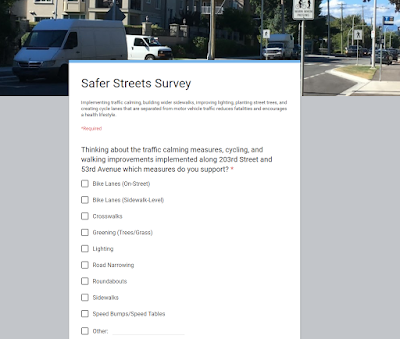 Improving lighting, sidewalks, and crosswalks are key priorities for me. Implementing traffic calming where requested by residents in our community, and making cycling safer are also important to me. With the changes made to our road network this year, I would like to know your opinion. What has worked well? What needs to be re-examined? Is the City on the right course? Please take the 30-second survey that I’ve posted online, and let me know your thoughts! People who identify as lesbian, gay, bisexual, trans, queer, or two-spirited are at a higher risk of being bullied, experiencing homelessness, and committing suicide. Much of this is because of a lack of systematic support in our society, with peers, and at home. Support systems for people who are LGBTQ2 has improved over the last decade, though there is still much more work to be done. In Langley, there is some support for youth who are LGBTQ2, though many still feel that they must head into Vancouver to truly feel included and accepted. While it is appropriate that there is a focus on helping LGBTQ2 youth in Langley, there is virtually no support services for LGBTQ2 seniors in our community. For many seniors, mobility can be a challenge; heading into Vancouver is simply not an option to get access to LGBTQ2-focused support and services. Research from QMUNITY suggests that there are at least 25,000 people over the age of 65 in Metro Vancouver and the Fraser Valley who identify as LGBTQ2. Social connections are critical for people’s feeling of worth, and mental health. 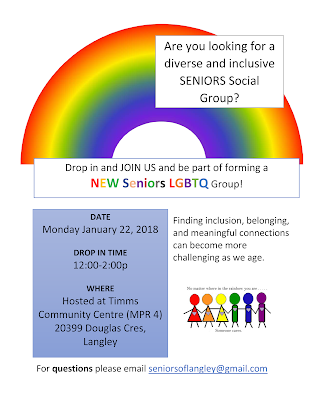 In Langley City, LGBTQ2 seniors will now have an option to connect with others to find inclusion and belonging. New seniors' LGBTQ2 social group poster. Select image to enlarge. 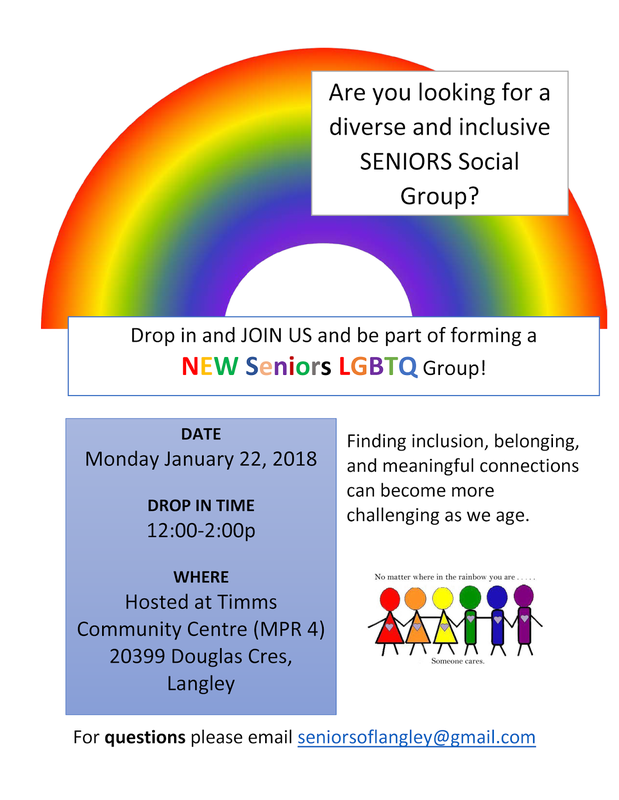 The first seniors’ LGBTQ2 social gathering will be held on Monday, January 22, 2018 from noon until 2pm at Timms Community Centre. Development Cost Charges (DCCs) are used to pay for improving infrastructure that is required to support new development projects. Municipalities can collect and use DCCs to pay for building or upgrading sewage, water, drainage system, and roads. Municipalities can also use DCCs to pay for new park land and for improving parks. The Metro Vancouver regional district collects a DCC to help pay for expanding the sewerage system. School Districts also collect a DCC which is known as a School Site Acquisition fee which is used to purchase land for schools. The following table shows all these charges in Langley City. Development Cost Charges in Langley City. Effective April 28, 2014. Select table to enlarge. The idea is that growth should pay for growth, and that developers should pay their fair share for infrastructure required to support their projects. Office, Institutional: $0.50 per sq.ft. In Langley City, this DCC works out to be around 10% of the DCCs that the municipality charges. This regional DCC is expected to generate between $20 million and $25 million per year. 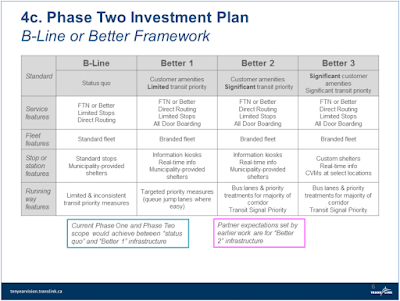 There was discussion about making this proposed regional transportation DCC stepped, meaning that development projects closer to transit service would pay a higher DCC. The current proposal is to have a flat DCC throughout the region. This is to simplify the administration of this DCC. In the future, a stepped DCC could be considered. In addition, it is proposed that agricultural uses, affordable rental housing projects, and statutory places of worship projects will be exempt from this regional transportation DCC. It is expected that the provincial government will support creating enabling legislation for the collection of this new DCC. When the fare gates on the SkyTrain system were finally closed in the summer of 2016, there were some customers that were no longer able to use the system independently. TransLink estimated that there were around 15 to 50 people with limited mobility who would now need SkyTrain staff to assist them to access the system. Taking away a person’s independence is something that shouldn’t be taken lightly, and TransLink planned to upgrade the accessible fare gates at stations to give people back their ability to independently use the SkyTrain system. If you look above the accessible fare gates at many of the SkyTrain stations, you’ll see a white rectangular panel. This panel is an RFID reader which will be able to detect a person who has a special card. If it senses this special card, it will open an accessible fare gate. 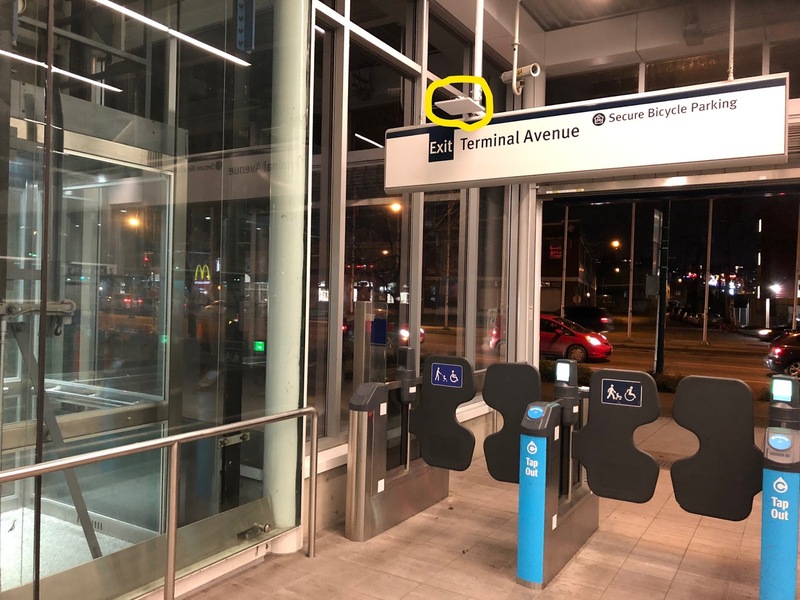 A new RFID reader installed at Main Street – Science World SkyTrain Station. Part of TransLink’s Universal Fare Gate Access Program. Select image to enlarge. 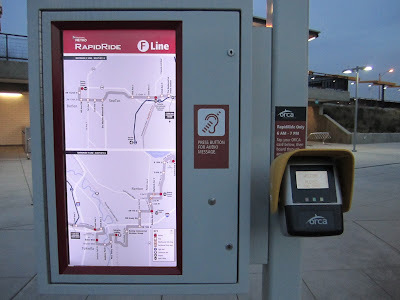 Resident of [Metro Vancouver] who is a person who travels independently and due to a disability, confirmed by a medical practitioner, is physically not able to tap fare media, without assistance, at a Compass Fare Gate, to use conventional SkyTrain and SeaBus. 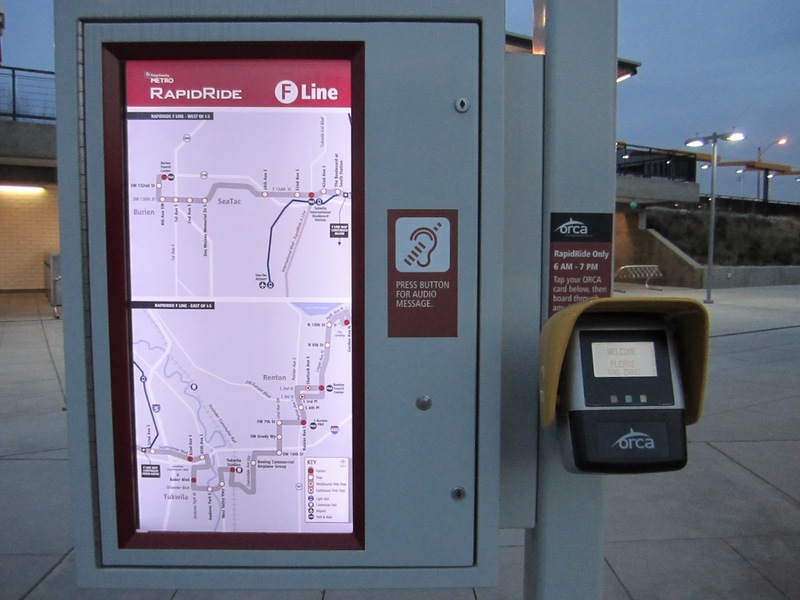 TransLink management hopes that by starting the rollout of this program before the RFID readers are fully functional, they will be able to better tune the system based on the number of people that enroll in the program. Our SkyTrain system used to be barrier-free, and over the years, TransLink worked to make the system fully accessible. When the fare gates were closed, accessibility was reduced which is unacceptable. 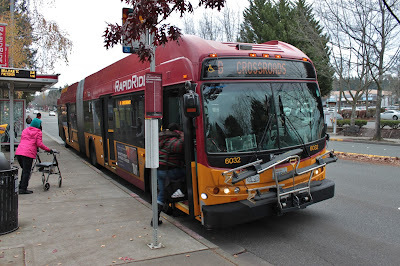 Bringing back independent access for transit customers is critically important. I’m happy to see that TransLink is taking this matter seriously. December 11, 2017 Council Meeting Notes: City's own GHG emissions down, plus 48 Avenue sewer replacement moving forward. Last night was the final Langley City council meeting of 2017. 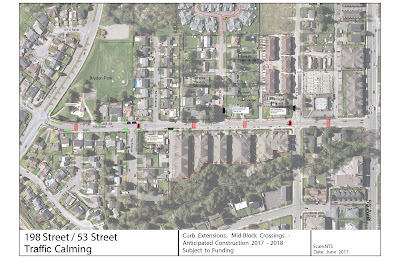 Two of the major items on the agenda were the receipt of the 2016 Corporate Energy and Greenhouse Gas Emissions (GHG) Inventory, and tendering a contract to replace a section of sanitary sewer between 208 and 210 Street along 48 Avenue. Langley City is a signatory to the BC Climate Action Charter. As such, we are committed to reduce our own GHG emissions by 134 tonnes between 2008 and 2018. The major incentive of being a signatory to the BC Climate Action Charter, and reducing GHG emissions, is that the City receives a 100% refund of any carbon tax that it pays. The City has met its original target of reducing direct GHG emissions by 134 tonnes. The following table shows the year-over-year reduction throughout the last eight years. 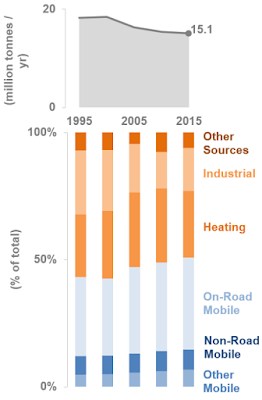 Most of the reductions in GHG emissions have been obtained by making municipally-owned buildings more energy efficient. 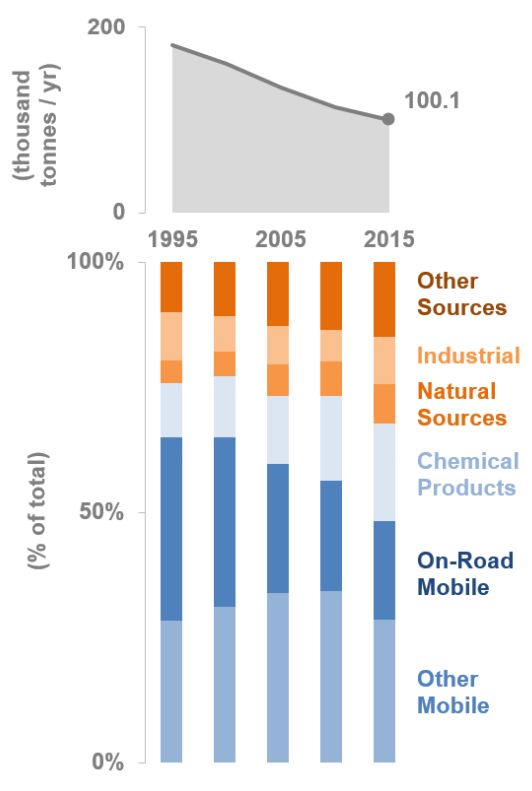 There is still work to be done to make our vehicle fleet less GHG intensive. 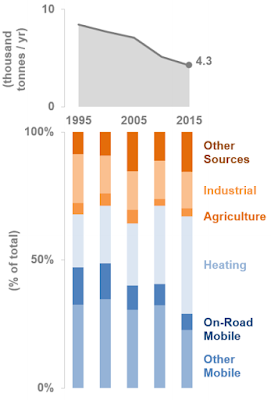 Langley City direct GHG emissions. 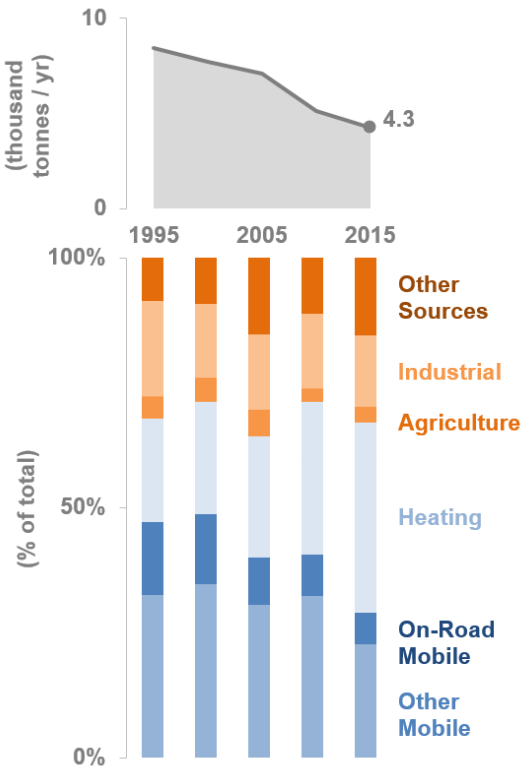 2008 – 2016 Tonnes CO2e. Select chart to enlarge. The City must also report GHG emissions from contacted services. In 2016, contact services added an additional 128 tonnes of CO2e emissions to our bottom line. Over the next several years, the City will be replacing 100% of municipally-owned streetlights with LED lights. City staff is also developing a new 10-year GHG reduction plan. Council also approved awarding a $495,000 contract to PW Trenchless Construction Inc. for the 48 Avenue sanitary sewer replacement. City council adopted seven bylaws last night. Most of the bylaws were related to water, sewer, and garbage services. You can read more about these in a post I wrote last week. The other bylaw was a housekeeping amendment to the Council Procedure Bylaw. Council appointed the following people to the Advisory Planning Commission for 2018: Trish Buhler, John Beimers, Jamie Schreder, Dan Millsip, Kimberley, Kim Mullin, and Ron Madsen. The Advisory Planning Commission “reviews development proposals while considering criteria that includes: overall design appeal, form and character, siting of the buildings and total site development in relation to its surroundings.” The commission provides advice to council and developers for consideration. City council members sit on about two dozen committees. Council approved the list of committee appointments for 2018, as well as the finalized 2018 regular council meeting schedule. 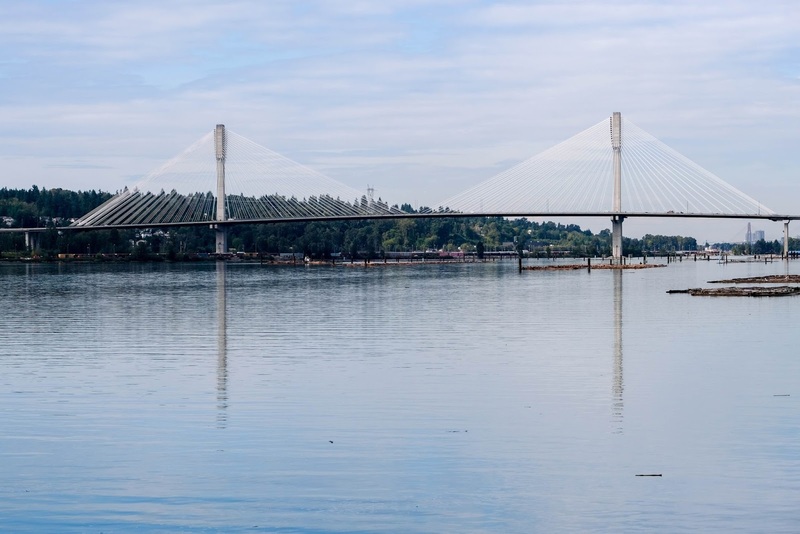 At the start of September, the provincial government removed the tolls from the Port Mann and Golden Ears Bridges. Transportation planners predicted that there would be a marked increase in vehicles across these two bridges. They were not wrong. Preliminary data and personal anecdotes suggested that traffic ballooned across the Port Mann and Golden Ears. Unprompted, Langley residents have been telling me that they want the tolls back to make their commutes faster again. TransLink staff crunched the numbers, and they found that traffic was up close to 30% on the Port Mann Bridge and 30% on the Golden Ear Bridge. They also found that traffic decreased by 11% on the Pattullo Bridge, 5% on the Alex Fraser Bridge, and 2% through the Massey Tunnel. Truck traffic decreased 19% on the Pattullo Bridge. 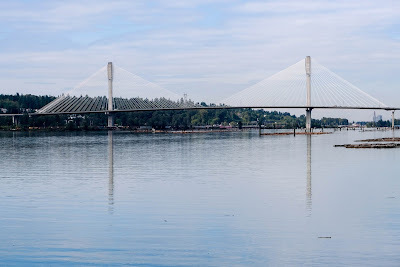 There was a 30% increase of truck traffic on the Golden Ears Bridge, and 15% increase on the Port Mann Bridge. When all Fraser River crossings are considering, there was an overall average 7% increase in traffic during the weekdays and 9% increase on the weekends. That’s an extra 30,000 vehicles per day! At the same time, transit ridership across the Fraser River has continued to grow at a similar rate as last year. These extra 30,000 vehicle trips materialized out of thin air. This is called induced demand. Simply put, more vehicle lanes produce more traffic. How did this increase people’s commute times? Travel between New Westminster/Surrey or New Westminster/Coquitlam by car is now faster. Otherwise, travel times are longer. The removal of the tolls at the Port Man Bridge and Golden Ear Bridge has been an excellent case study of tolling and its impact on congestion. The only way that our growing region will be able to reduce vehicle congestion along major corridors will be by implementing a system of fair tolls at all major crossing. I believe that as a region-wide tolling system is implemented, gas tax should be lowered. This is one way to make the new tolling system fair. The Mayors’ Council’s Mobility Pricing Independent Commission is looking a different decongestion road pricing options. Tolling is only one of the options that they are looking into. The commission will be presenting its recommendations early next year for the provincial government to consider. 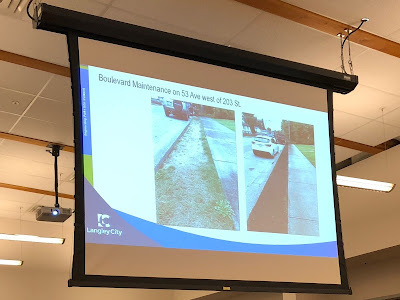 Over the last few days, I’ve been posting about items that were covered at Monday night’s Langley City council meeting. I posted about the library system on Tuesday, and about water, sewer, and garbage services on Wednesday. Today, I will be covering the remaining items. Even though winter is only a few weeks away, Langley City crews are still busy making improvements throughout our community. Council received an update from Rick Bomhof, Director of Engineering, Parks & Environment. The 200th Street Bridge upgrades over the Nicomekl River is compete. 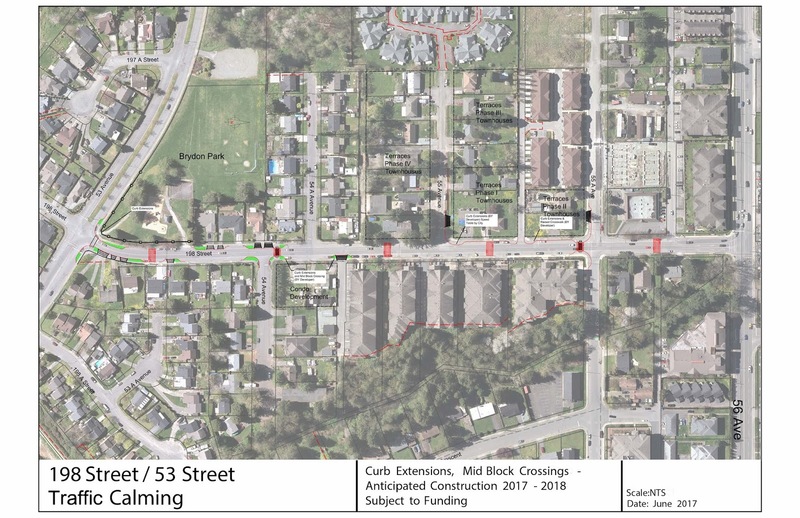 There is still some work which will be done in the new year between 50 Avenue and Grade Crescent, including installing a new traffic light at 50 Avenue and repaving. 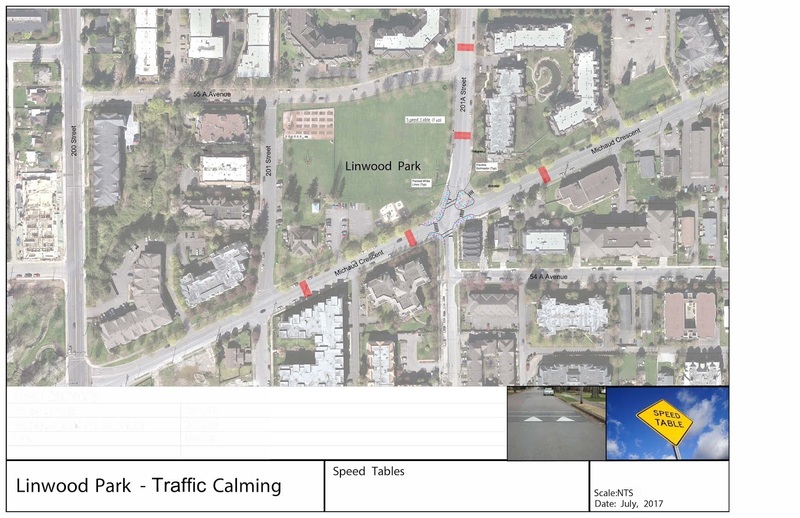 Traffic calming is currently being implemented near Linwood Park and Conder Park, with speed tables now in place. 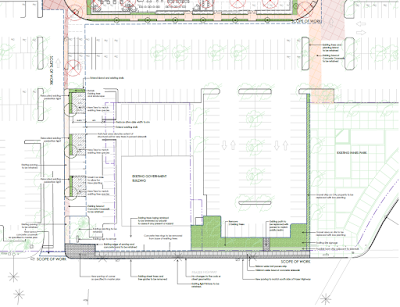 If you are around Timms Community Centre, you will see that the sidewalks to the centre are being replaced with concrete sidewalks which will improve accessibility. On the topic of accessibility, Langley City is also replacing pedestrian buttons at traffic lights. While a small change, these new buttons are more reliable. An example of a new pedestrian signal button in Langley City. Select image to enlarge. Work is continuing along 56 Avenue, and it is expected to be wrapped up for the season in the next few weeks. Other projects on the go include the 48 Avenue sewer replacement, and culvert upgrades along Production Way and the Langley Bypass. 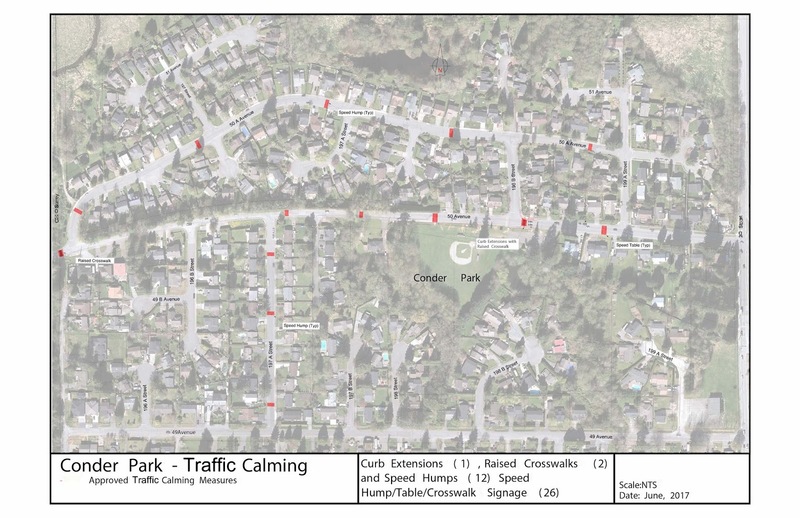 Park improvements in progress include expanding the spray park at City Park, upgrading the sports fields at Rotary Park, and adding washrooms and a picnic shelter at Penzer Park. Six scholarships to graduating students who reside in the City of Langley will increase from $600 to $750 each. Support for the Youth Parliament will increase from a total of $600 to $1,000. A new $15,000 grant for the Langley Senior Resources Society to be used to subsidize the membership packages for low income seniors living in the City of Langley and for upgrades and maintenance to the facility. I’m extremely pleased that council decided to provide stable and consistent operating funding for the Langley Senior Resources Society which provides critical social and recreational services for older people in our community. Langley City has supported the society for many years. The City contributed $40,000 per year towards the society’s mortgage since 1998, paying it off fully in 2014. Langley City council also approved an update to our own remuneration. Currently, one third of council salary is tax-free. The federal government announced that starting in 2019, they will be making the salary of local government elected officials fully taxable. To compensate for this change, the mayor’s remuneration will be changing from 85% of the median of other municipalities in our region to 100% over the next two years. Other council member’s remuneration will increase from 40% to 45% of the mayor’s remuneration. There will be a temporary 11% increase to the mayor’s remuneration in 2019 that will be evaluated in 2020 to see if it is still warranted based on remuneration in other Metro Vancouver municipalities. These changes will result in a $53,000 increase in the City’s budget for 2018 which is about 0.1% of the overall budget. Council voted to extend the Crime Prevention Task Group’s mandate into 2018, and also voted to approve the 2018 regular council meeting dates. Council also gave final reading, and approved the issuance of a development permit for a townhouse project located along 55A Avenue. With the end of the year, also come planning for water, sewer, and garbage services for 2018. Council gave first, second, and third reading to six bylaws relating to the delivery of these services on Monday night. Stage 1: reduces demand in summer months, and is automatically in effect on May 1 until October 15. Stages 2 and 3: activated and deactivated by the GVWD Commissioner, are likely to be activated during unusually hot and dry conditions to maximize conservation. Stage 4: activated and deactivated by the GVWD Commissioner during an emergency to immediately limit water use to essential needs only. Metro Vancouver has posted a document online which outlines what water uses are restricted during different stages. Langley City is incorporating Metro Vancouver’s water conversation plan into our bylaws. Langley City council also gave three readings to update our municipal ticketing bylaw which will see an increase in fines for unauthorized watering when restrictions are in place. Council gave three reading to update the City’s fees and charges bylaws to allow lawn sprinkling permits for new lawns, and existing lawns to receive nematode application during certain stages of water conservation. Langley City garbage collection fees will be increasing by $10 in 2018. Council gave three readings to increase the flat fee to $190 per year. This is due to a 38% increase in green waste disposal costs, plus a 3% fee increase from Metro Vancouver for handling garbage. Langley City provides garbage collection services to single-family housing only. Water and sewer fees are increasing in 2018. Council gave three readings to bylaws that will increase the water consumption charge by $0.07 per cubic metre, and $0.07 per cubic metre for sewer. These rate increases are primarily driven by Metro Vancouver who provides water and sewer services to municipalities in our region. The proposed new water rate will be $75 per year, plus $1.23 per cubic metre of use. The proposed new sewer rate will be $75 per year, plus $1.11 per cubic metre of use. On the topic of sewer, Langley City council authorized funding for upgrading the sewer line along 48 Avenue between 208 Street and 210 Street. Yesterday, I posted about our library system. Tomorrow, I will be posting about the remaining items that were on the agenda of Monday night’s council meeting. 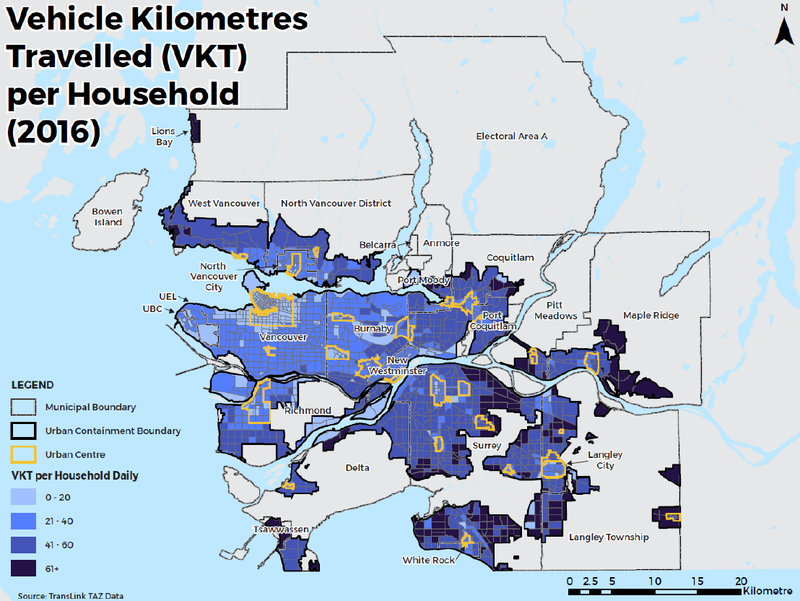 On Thursday, I posted about transit mode share in Metro Vancouver, focusing on South of Fraser communities. The most recent 2016 census data shows that more people are choosing to take transit to get to work than ten years ago. In the South of Fraser, transit mode share growth is occurring at a greater rate than the regional average. One of the key metrics for commuting is how long it takes to get to work. 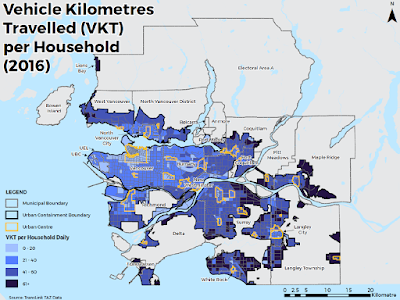 In Metro Vancouver, the average one-way commute to work by car is 27.3 minutes. With active transportation options such as walking or cycling, the average one-way commute to work is 17.4 minutes in our region. On average, people spend 43.6 minutes on transit getting to work in Metro Vancouver. 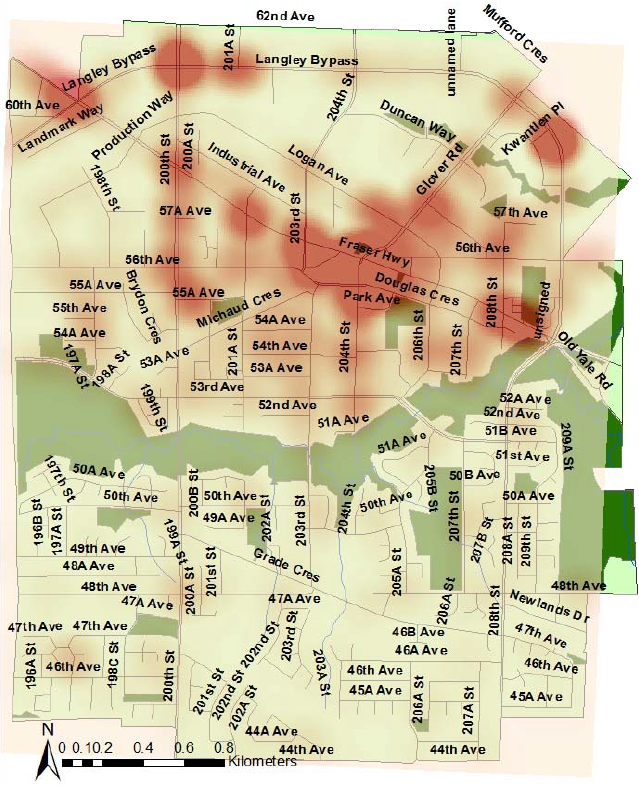 How do South of Fraser communities compare to regional averages? 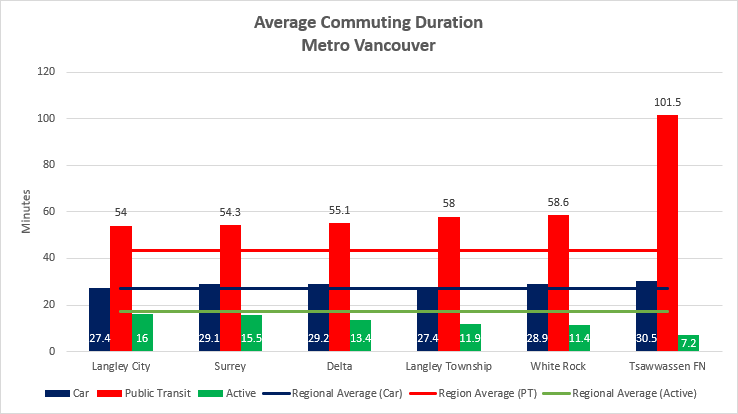 Average commuting duration in Metro Vancouver with a focus on the South of Fraser. Select chart to enlarge. Source: 98-400-X2016324 Data tables, 2016 Census. For commuting by car, the South of Fraser is comparable to the rest of the region. 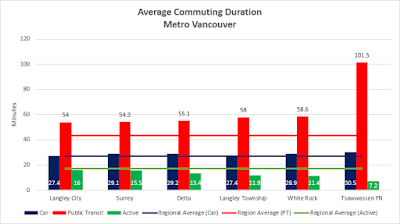 Active transportation commute times are below the regional average outside of Langley City and Surrey. What really stands out is average commuting time on public transit. Excluding Tsawwassen First Nation, which is an outlier, the average one-way commute on public transit in South of Fraser communities is 56 minutes. This is 28% higher, or 13 minutes longer, than the regional average. The South of Fraser lacks rapid transit throughout the vast majority of the sub-region. 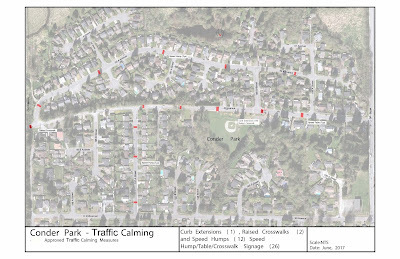 With rail rapid transit in the works along King George, 104th, and Fraser Highway, I would expect commute times to decrease once it is built-out. Statistics Canada recently released information on the primary mode of transportation that people use to get to work. Over the last decade, there has been serious investments made into public transit in Metro Vancouver, and within the South of Fraser. These investments are paying off. 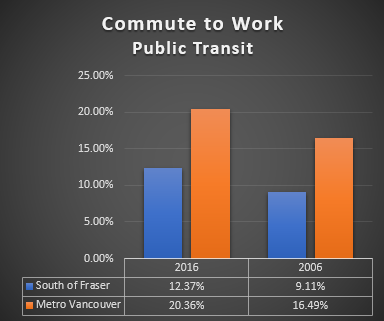 Commute to work by public transit in Metro Vancouver and the South of Fraser. Select chart to enlarge. Source: 2006 Community Profiles, 2016 Census Profile. More people are choosing transit as their primary mode of getting to work. 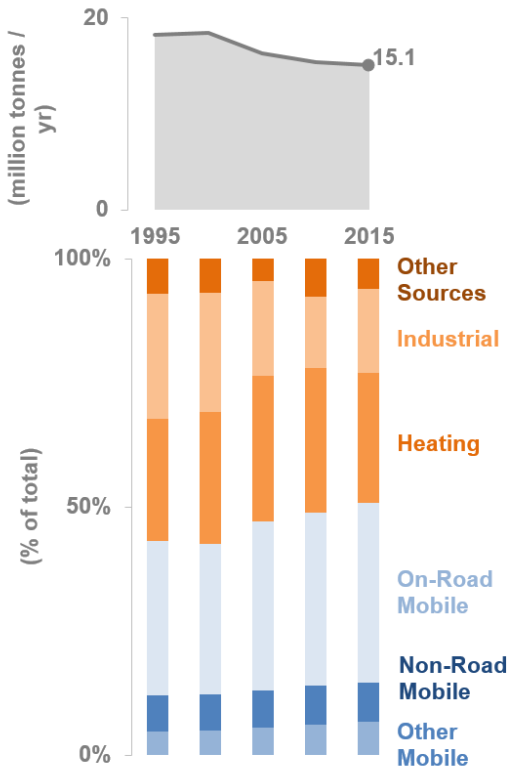 In Metro Vancouver, transit mode share has grown by 23% in the last decade. 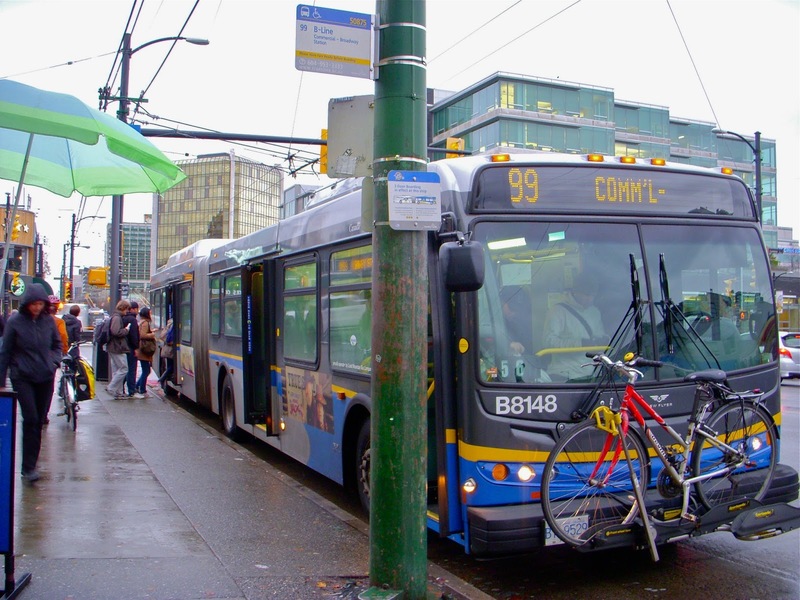 Transit mode share has grown 35% in the South of Fraser, faster than the regional growth rate. Commute to work by public transit in South of Fraser communities. Select chart to enlarge. Source: 2006 Community Profiles, 2016 Census Profile. 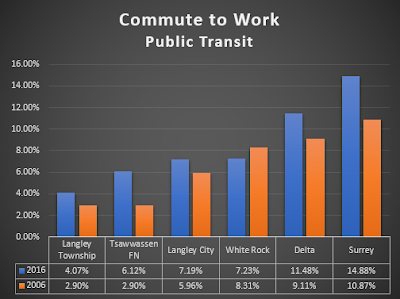 Within the South of Fraser, the Township of Langley has seen the largest growth in transit mode share of any municipality, up 40%. 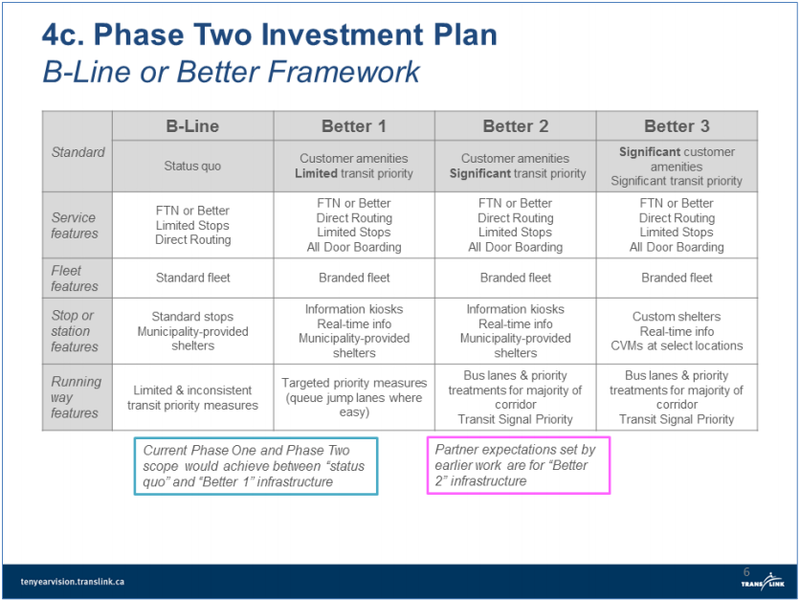 Interestingly, White Rock saw a 13% decline in transit mode share. 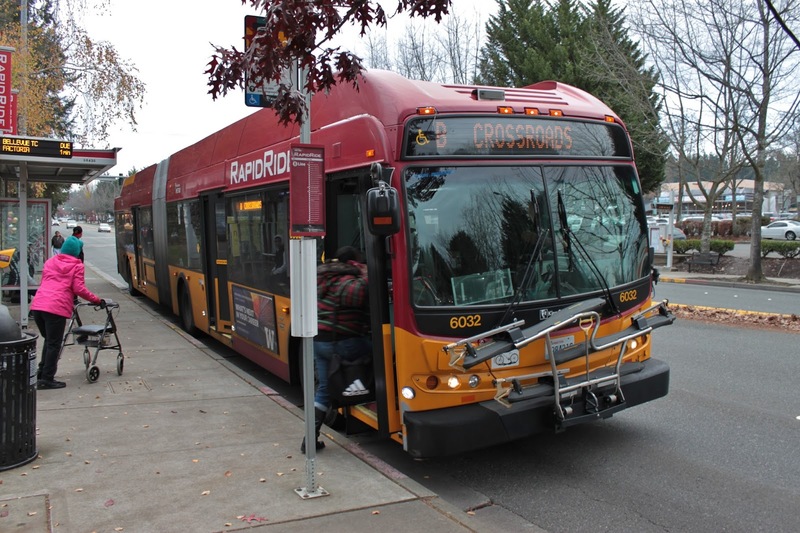 TransLink’s numbers show that transit ridership is growing faster than population growth in our region. This is corroborated by Statistics Canada census data. 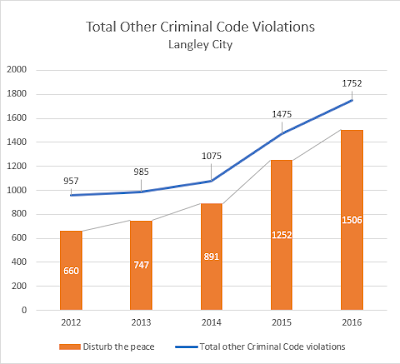 Last week, I posted about the crime statistics provided by the RCMP at the latest Langley City council meeting. Langley City is a 10-square kilometre urban core. Covering Downtown Langley, the Langley Bypass, and sections of Willowbrook, we are the commercial centre of Langley. We also have very real socioeconomic challenges in our community such as people living in poverty, and people who are homeless. These aspects of our community, combined with our geography and small population, mean that our crime rates will be higher than other communities. 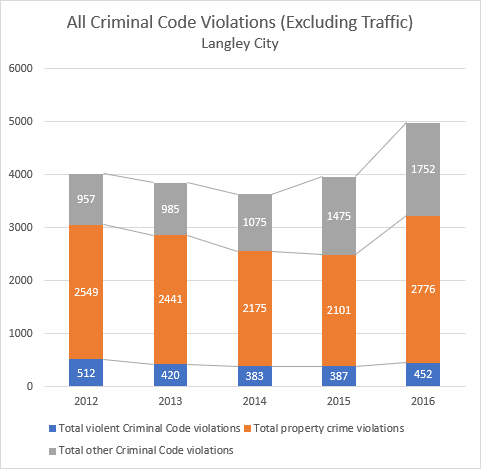 What kind of reported criminal code violations do we see in Langley City? I decided to dig into the most recently available Statistic Canada data. This data covers up until the end of 2016. Before I get into the details, I wanted to provide a bit of context around these statistics. People need to report crime and suspicious activity for it to show up as a statistic. The more crime that gets reported, the higher the statistic. In Langley City, we have been actively encouraging both residents and business owners to report crime and suspicious activity. While it might inflate our statistics compared to other communities, it helps the RCMP make Langley City safer. The first table looks at total Criminal Code violations (excluding traffic such as speeding). The three broad categories are violent violations, property crime violations, and other violations. All Criminal Code Violations (Excluding Traffic), Langley City. Source: CANSIM Table 252-0081. Over the last five years, total violent violations have been trending down though there was an uptick in 2016. Violent violations are crimes committed against people such as assaults. Property crime and other criminal code violations have seen a marked increase. Digging deeper, what has caused these increases? When it comes to property crime, theft under $5,000 is the largest driver in these stats with theft from automobile seeing a significant increase. Another category that has been on the rise is shoplifting. 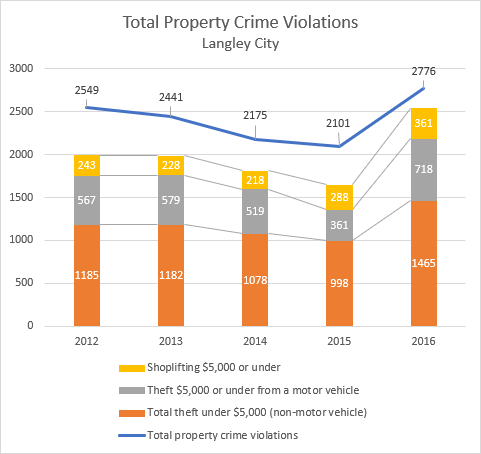 Total Property Crime Violations, Langley City. Source: CANSIM Table 252-0081. For other criminal code violations “disturbing the peace” has more than doubled in the last five years. Total Other Criminal Code Violations, Langley City. Source: CANSIM Table 252-0081. For both shoplifting and “disturbing the peace”, I would venture to guess that this is a result of an increase in people reporting crime and suspicious activity. I know that the RCMP are aware of the increase in opportunities crime in our community, and are working to get prolific offenders off the street. 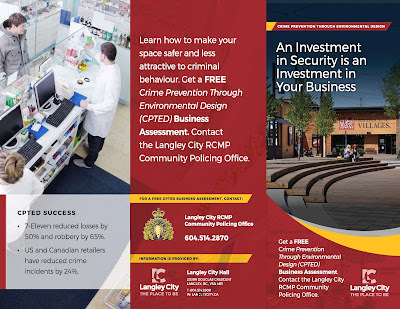 At Langley City, we are encouraging people to continue to report crime and suspicious activity. 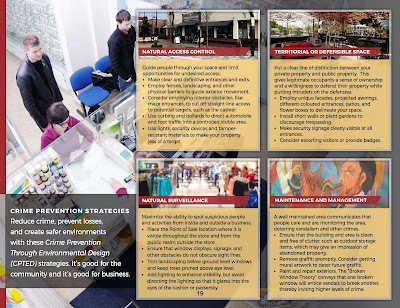 We are also actively encouraging businesses to get free crime prevention assessments from the RCMP. We are also working to get more eyes and ears on the street which reduces the kinds of opportunistic crime that we see in our community. By enhancing our parks, and providing more evening activities in our Downtown Core, we are getting more people out in the community. Homelessness and poverty are serious issues in our community. Langley City council is continuing to advocate to the federal and provincial governments to ensure that all people in our community can get housing and the support they need. You can read a recent blog post about some of the concrete actions that are being taken on these matters in Langley. 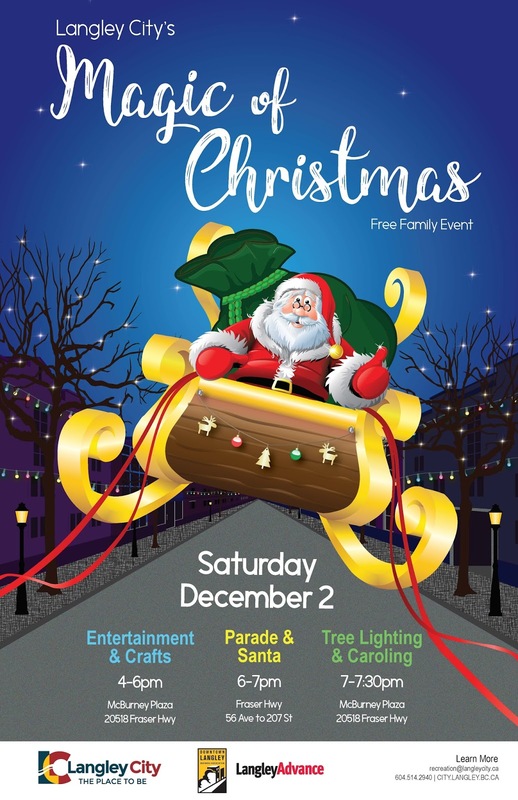 The Christmas lights are up in Downtown Langley, and with this weekend being the first of December, Langley City has a packed schedule to help you get into the Christmas spirit. This Friday between 5:00pm and 7:00pm, you can carol in McBurney Plaza. Sing some Christmas classics with other carolers, and enjoy some hot chocolate. You can also merrily carol on December 9th, 15th, and 23rd at the same time and location. Breakfast with Santa runs between 9:00am and 11:00am at Douglas Recreation Centre on Saturday. This is a family event. In addition to Santa, there will be crafts, face painting, and a magic show. Breakfast includes pancakes, sausage, bacon, juice, tea, and coffee. The breakfast is $10, and you can register at Douglas Recreation Centre or by calling 604-514-2865. Later during the day, head to McBurney Plaza. There will be free entertainment and crafts starting at 4:00pm. At 6:00pm, the Magic of Christmas Parade starts. The parade route runs along the one-way section of Fraser Highway. The lighting of the Langley City Christmas Tree will occur at 7:00pm in McBurney Plaza, followed by carolling. These events will occur whether the sky is clear, or it's raining. I look forward to this weekend every year. I hope you’ll get a chance to head to Downtown Langley, and rediscover the magic of Christmas! 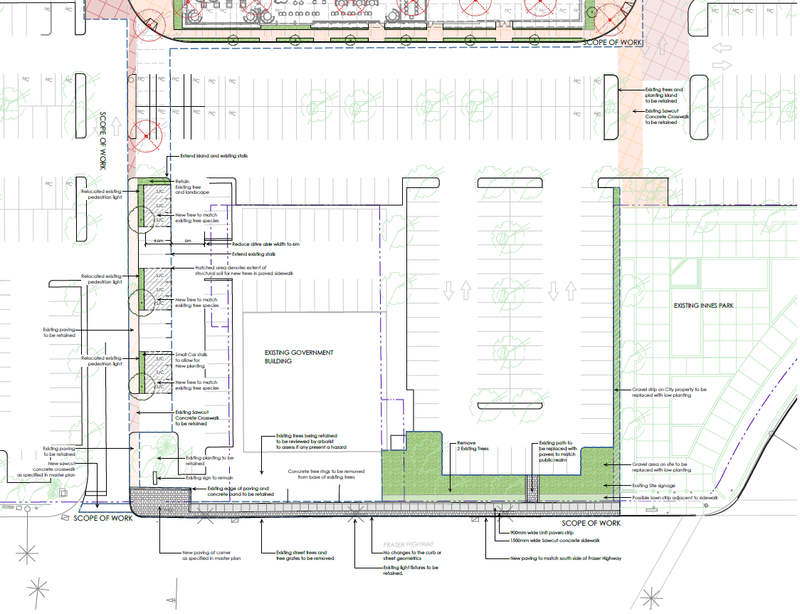 Yesterday, I posted about the development permits that were approved at Monday night’s Langley City council meeting. Today’s post will cover the remaining items that were on the agenda. The Langley RCMP provided their most recent report to council. In the report, the RCMP noted that they now have a “Stalker” patrol radar system which allows officers to catch speeder both in front of, and behind, a police motorcycle. Langley City’s Bylaw Department and the RCMP are working together to target problem residences in our community. They have been working to resolve issues at three of these properties during this reporting period. The RCMP and our bylaw officers continue to monitor and address homelessness matter, and are working with local agencies that can help people get off the street. The following pie chart shows the types of files that the RCMP worked on in the second quarter of this year. Most files where around mental health matters, assisting the public, responding to suspicious occurrences, and executing warrants. 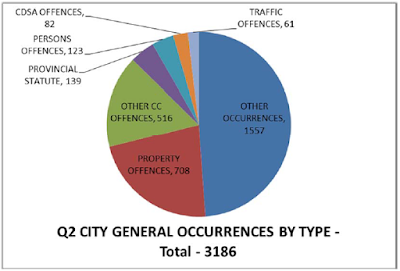 RCMP file breakdown by type in the second quarter of 2017. Other CC offences include impaired driving. Select chart to enlarge. The following map shows crime “hotspots”. The hotspots were focused around commercial area in the second quarter of this year. 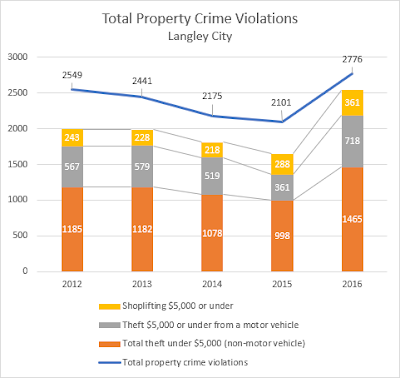 Langley City crime map for the second quarter of 2017. Select map to enlarge. Every municipality is required to have a Council Procedure Bylaw. This bylaw establishes how council and council committees operate. Council voted to move forward with an update to our procedure bylaw on Monday. One of the major changes is to move the inaugural council meeting to the November right after an election, as local government elections have been moved to October. Other changes include updating the notification process for closed council meetings, how motions can be brought forward at council meetings, and some other various housekeeping items. Council also approved our Fire Chief Rory Thompson to attend the Fire Department Instructor’s Conference, and our CAO Francis Cheung to attend the Canadian Association of Municipal Administrators Annual Conference. Council supported a grant application for $25,000 from the Community Emergency Preparedness Fund which is managed by the Union of BC Municipalities. If we are successful in getting the grant, the funding will be used to purchase supplies and equipment to set up group lodging kits. These kits would include shelter tents, cots, blankets, pillows, generators, heaters, and lighting equipment. Trump’s now infamous remark calling Hillary Clinton a “nasty woman” has become a rallying cry for women across the political spectrum to take a stand against the sexism and misogyny they face in politics because of their gender. On Wednesday November 22nd, the fourth Metro Conversations will be addressing this topic. Metro Conversations was started by a group of four like-minded elected officials from across Metro Vancouver. Rather than a lecture format, panelists will speak about their experiences and audience members will be encouraged to add their voice to help shape the conversation. 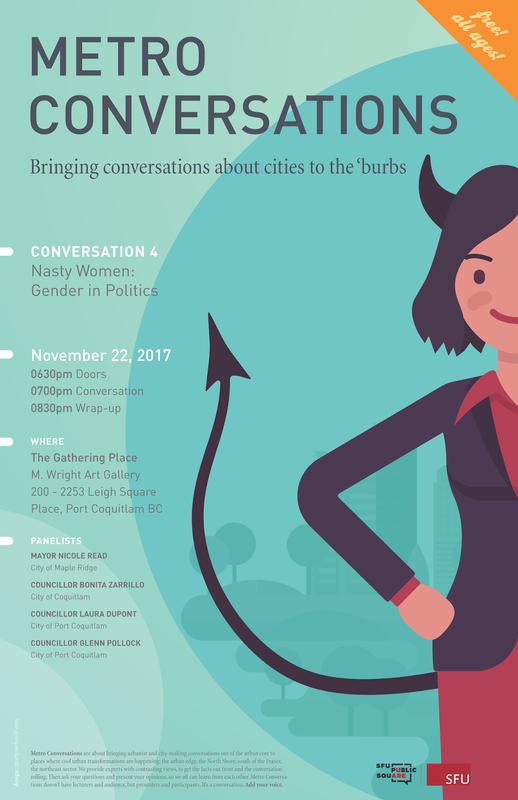 “Most people outside of politics aren’t aware of the blatant misogyny women have to contend with in their role as elected officials” says Councillor Kiersten Duncan from the City of Maple Ridge who is the main organizer of this event. “It creates an unsafe working environment which inherently discourages women from getting involved in politics”. Councillor Duncan credits her colleagues Councillors Nathan Pachal from the City of Langley, Patrick Johnstone of New Westminster, and Mathew Bond from the District of North Vancouver for coming up with the idea. “It’s surprising how normalized misogyny is, many people don’t even realize they’re being inappropriate,” says Councillor Pachal. Councillor Bond hopes that women interested in running in next fall’s municipal elections will consider attending, hoping that this event will give them insight into some of the challenges they will face. Panelists include Councillors Laura Dupont and Glenn Pollock from the City of Port Coquitlam, Bonita Zarillo from the City of Coquitlam, and Mayor Nicole Read from the City of Maple Ridge. Everyone is welcome. Seating is limited, and it is recommended to register to reserve your seat. Would you be willing to pay a small deposit on single-use cups or food containers? Most single-use cups and containers are recyclable, but they still end up in the garbage or discarded onto the street. Light-weight foodware which includes cups and containers make up 10.7% of the material that ends up in street bins by weight in Metro Vancouver based on 2016 data. The City of Vancouver found that this translates into 50% of material by volume in their street bins. This is significant. In contrast, containers with a deposit make up 4.4% of the material that ends up in street bins by weight. 2.4% of that is glass which is heavy. Our deposit system is helping to effectively recover certain types of containers. Our region has a binners community whose members collect containers that have deposits from our street bins and other public spaces. Tides Canada is a national charity which supports initiatives across the country that support positive environmental and social change. 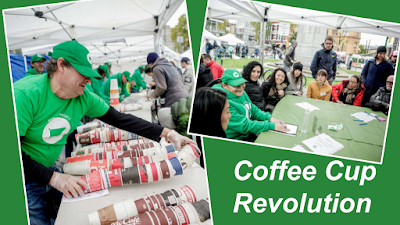 In our region, one of their initiatives is the Coffee Cup Revolution where a pop-up coffee cup recycling depot at Victory Square is setup for a few hours. Slide from Binners’ Project presentation delivered to Metro Vancouver’s Zero Waste Committee. Select image to enlarge. In 2016, 175 binners collected 50,000 coffee cups to receive 5 cents per cup in a few hours. 210 binners collected 53,783 coffee cups within three hours on October 16, 2017. One of the major goals in the Metro Vancouver Regional District Integrated Solid Waste and Resource Management Plan is to reduce waste. 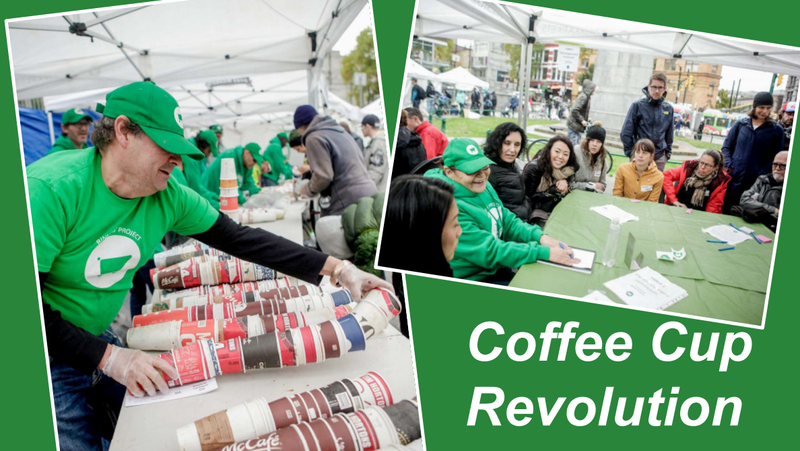 As such, the regional district is looking to support the Coffee Cup Revolution initiative with $6,000 annually for three years. This funding would be used to improved data collection, develop a waste characterization study, support round-table discussions, and provide a portion of the coffee cup refunds and pop-up recycling depot costs. 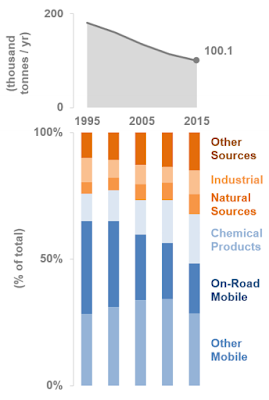 63% of waste was diverted from going to a landfill, or ending up in a waste-to-energy facility in our region in 2016. The street bin diversion rate was only 40% in 2016. There is still much more work to be done. Considering the contribution of single-use cups and containers to our region’s waste, I could see the regional district advocating to the provincial government for an expanded deposit refund system for containers in Metro Vancouver. 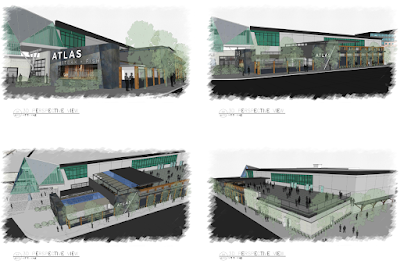 While no decisions were made a last night’s Langley City council meeting, the agenda was dense with updates from community organizations and our municipality’s departments. Before council heard the updates, two long service awards were presented to Langley City staff members. Mayor presenting long service awards to Langley City staff members. Select image to enlarge. The first presentation heard by council was for Canuck Place Children’s Hospice. Katrine Chow, who represented the organization, outlined the services they provide, and the number of families they help. As an example, in 2016, 715 families were helped by their programs with 44% of families coming from the Fraser Valley. 20 families lived in Langley. Most children are in their programs for 3 years. Chow also invited council to attend their Gift of Love Gala which is schedule for Saturday, February 17, 2018. 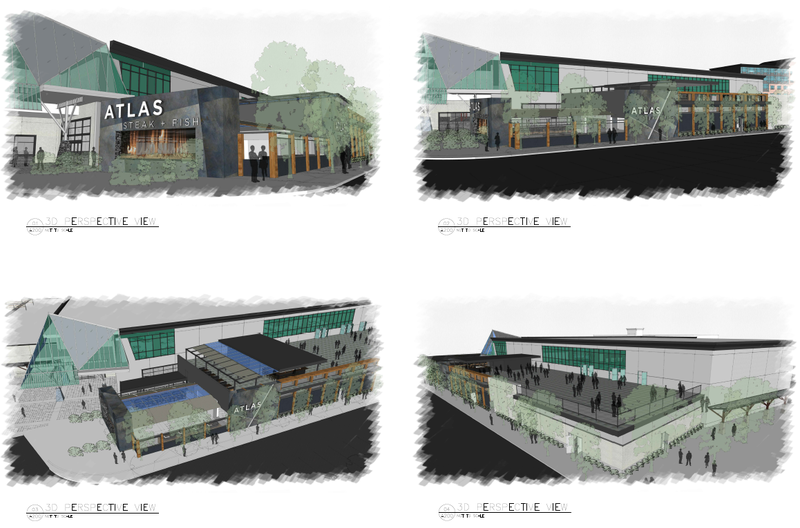 The next update from the Downtown Langley Business Association/Discover Langley City was presented by Teri James. She reviewed the 2017 McBurney Summer Series and Duelling Pianos Evening events. Both the daytime events and evening event were successful. Duelling Pianos in the Plaza, a 19+ event, was sold out within four days. For 2018, James outlined that they will be focusing on bringing high-quality entertainment for families during the day, and will be hosting an additional 19+ evening event with high-quality entertainment. Bringing positive evening activities to our downtown core is something that I believe is critically important. Not only does it help build community, but it also reduces negative activities in the evening. Between the McBurney Plaza Summer Series and other events, there will be something going on pretty much every weekend next summer in our community’s core. As was reported this summer, planning for a night market is still in the works for 2018 which will bring even more positive activity to our downtown in the evening. Later in the presentation, James introduced Melissa Phillips who is heading up Discover Langley City, our new destination marketing organization. Phillips comes from Richmond Tourism. Rick Bomhof, Director of Engineering, Parks & Environment, updated council on the activities in his departments. In 2017, council approved additional funding for an on-going corridor improvement program. Bomhof shared some pictures of the enhancements that were funded via the program. Example of street improvement on 53 Avenue near 203 Street. Select image to enlarge. Example of enhanced sidewalk maintenance in Downtown Langley. Select image to enlarge. Bomhof also noted that work is almost completed in Hunter Park. For more information, please visit the City’s website. Another major project is the 200th Street Bridge deck replacement. This project is scheduled to be completed in the next few weeks. Our City crews have been, and continue to be, extremely busy making our community awesome. Tomorrow, I will be posting about the remaining topics covered at Monday night’s council meeting.